Wolverine avenges an old friend. Outside the home of Bando Saburo, Wolverine battles a gang of street punks who killed the servants inside. 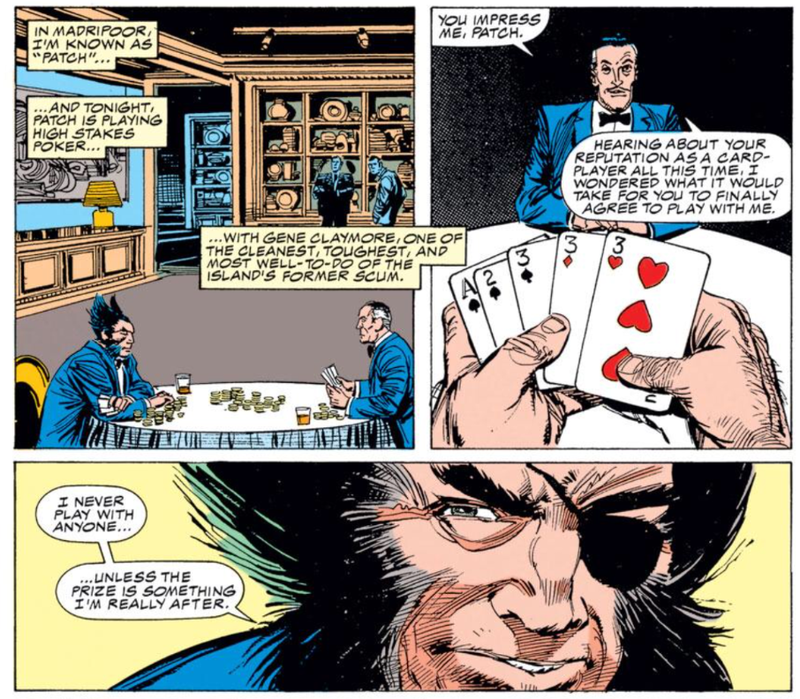 Later, he plays poker with Gene Claymore, one of Madripoor's wealthiest citizens. 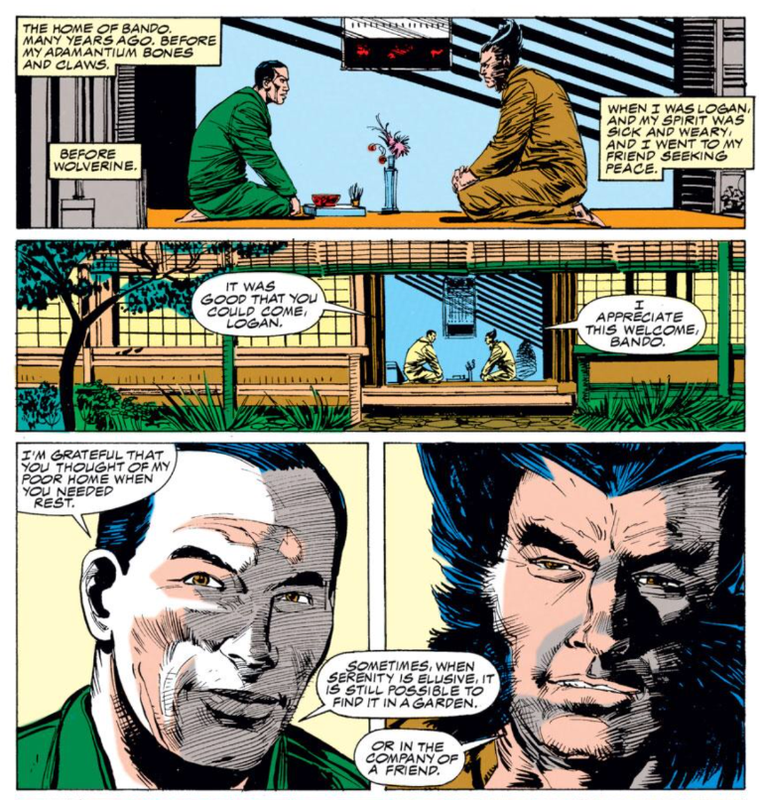 As he plays, Wolverine recalls staying with Bando, and Bando showing him a beautiful glazed bowl, the family's most prized possession, and telling him that Bando has named his nephew Masaki, troubled by his father's poverty, his heir. In the present, Wolverine is besting Claymore thanks to his animal senses, raising the stakes with each win. In the end, he wins everything Claymore owns, but tells him all he wants is Bando's bowl, along with the name and location of the person Claymore got it from. Claymore tells him it was Masaki, then rushes Wolverine, who trips Claymore and sends him crashing out a window to his death. Wolverine goes to Masaki's home and finds him preparing for ritual suicide, though Wolverine doubts he has the guts to go through with it. He tells Masaki he needn't have killed Bando for the bowl; Bando had cancer, and would have died soon anyway, and the bowl would have been Masaki's. Masaki attacks Wolverine, and Wolverine kills Masaki. 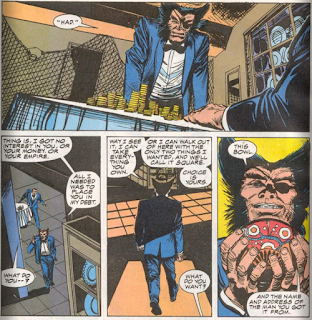 Later, Wolverine leaves the bowl on Bando's grave, thanking him for giving Wolverine a memory of peace and beauty he'll carry with him as he walks the road to hell. The character at the center of this issue, Bando, a man who helped teach Wolverine some semblance of peace in his pre-adamantium days, is yet another old friend we've never heard of before and will never see or hear of again. 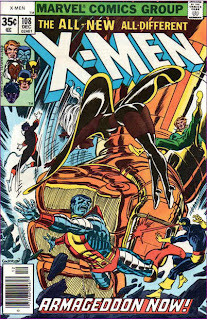 This kicks off Wolverine's return to bi-weekly shipping for the summer; unlike Uncanny X-Men, the series will do this again the following summer. 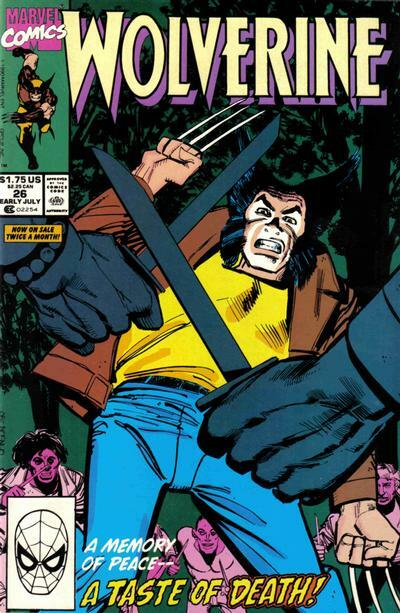 This issue contains a Wolverine pinup drawn by Todd McFarlane. Klaus Janson, who finishes most of the issues John Byrne drew during his run on the series, pencils this issue, with long time Marvel inker Tom Palmer embellishing him. 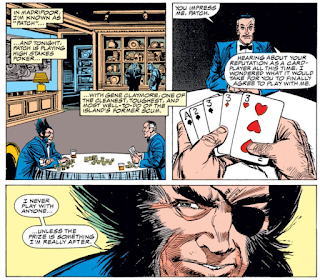 Wolverine is clearly still operating as Patch, and spends much of the issue playing two hand poker, something you see often in fiction but which doesn't really work in real life (that is, poker between two people isn't terribly exciting). 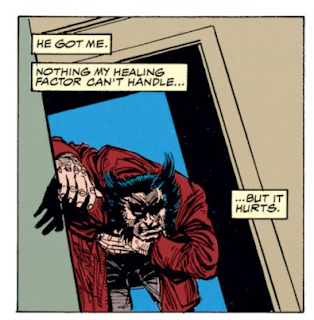 Wolverine notes that while his body is healing, the injuries still hurt. Wolverine runs afoul of some street punks who look like they shop at the same stores as Jubilee. Another done-in-one, and for the second issue in a row the story has at is core Wolverine's relationship with a character we've never heard of before nor ever will again. 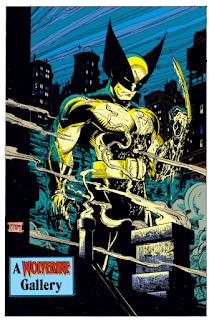 Where last issue used that relationship as an excuse for a possibly apocryphal look at Wolverine's past, this one is much more of a fable/morality play, as Wolverine is essentially operating as an agent of justice/just desserts in memory of his friend. It's a type of story that will become all too common for Wolverine done-in-ones, and while this particular one isn't the most exciting thing in the world (and the whole "here's another character who I totally have a strong connection with even though I've never mentioned him before" bit is already eye-rollingly cliche), it's perfectly cromulent. Duffy continues to display a solid grasp of Wolverine's voice, and it's always nice to see Tom Palmer's inks - here, he takes a bit of the rough edge off Janson's pencils, and the combination works. Ultimately, the biggest sin of this issue is being an entirely forgettable one that doesn't advance the character or the plot at all, but it's entertaining enough for what it is. Next week, "Days of Future Present" unfolds in Fantastic Four Annual #23, New Mutants Annual #6, and X-Factor Annual #5. McFarlane’s pinup is multiple kinds of bad. The storytelling’s pretty good but the instances of Logan’s face are so uneven and unlike one another that it’s ridiculous. I have a feeling you're going to get tired of writing that sentence. That's, basically, the plot of every single Wolverine done-in-one that has ever been published. You're right - his Wolverine faces are wildly uneven. It's probably something I should have noted. @Cerebro: have a feeling you're going to get tired of writing that sentence. That's, basically, the plot of every single Wolverine done-in-one that has ever been published. That's becoming clear already, though so far the done-in-ones have (mostly) been their own thing. We can change it up though. 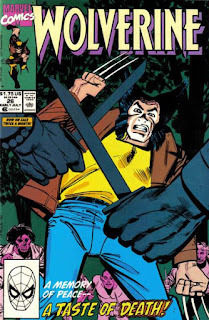 "Wolverine avenges an old friend...who had a pretty bowl!" "Wolverine avenges an old friend...who was a cop!" "Wolverine avenges an old friend...who was some kind of animal!" etc.